MAPA Books, a new independent publisher in Southeast Asia, debuts its first title in a slate of publications with Ili, a monograph by Baguio-based veteran photographer Tommy Hafalla. Next in line is SIGNOS by Veejay Villafranca. Along with a preview of Ili, we catch up with Mapa Books founder RJ Fernandez, a London-based photographic printer. Ili translates literally as “home village.” It is a word used widely in the Cordillera region to refer to one’s place of origin. As a member of an ili, one holds particular rights and is bound to certain responsibilities, including ritual obligations. Your ili is who you are — it is a point in space by which you identify and orient yourself, and a place through which others identify you and your kin. It is the place in which traditions are formed, as well as a site for profound historical, political, economic, and cultural change over time. The ili is more than ever a point of departure, and the place to which one returns after having been away from home. The ili is where you belong. For over three decades, Bartolome “Tommy” Hafalla (b. 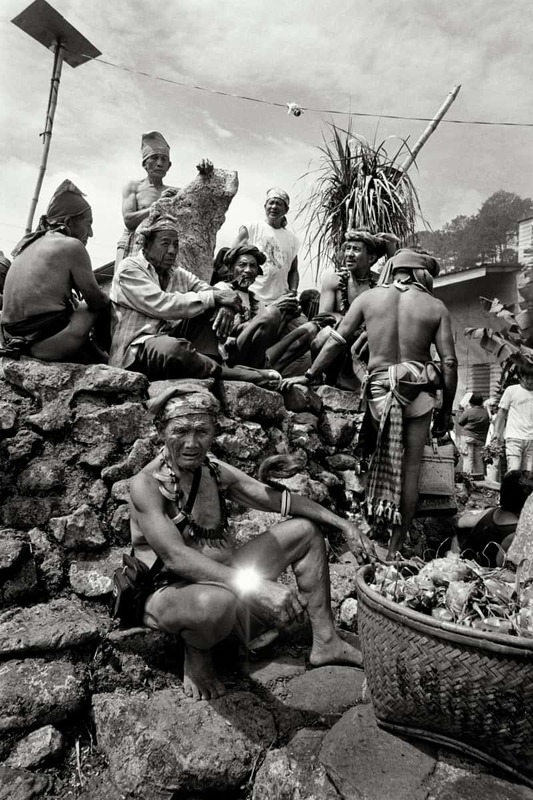 1957) has been documenting the life and rituals of the ethnolinguistic groups that occupy the Philippine Cordillera. These areas include Benguet, Kalinga, Ifugao and the Mountain Province. Hafalla incorporates himself and his camera in the rituals that he documents, moving away from the grand narrative towards the local and particular. Many of the rituals documented are not open to the public – thus providing a glimpse of tradition not usually seen. Recognizing that tradition is alive, creative and constantly shifting, his practice is to go back to the ili time and again to photograph the same ritual unfolding in its many iterations. These rare photographs that make up ILI span a period of thirty years from 1981-2011. Ili by Tommy Hafalla is available at www.mapabooks.com. Mapa Books is founded by RJ Fernandez, an independent photographer and printer based in London. Formerly associated with the legendary lab BD Images, she has worked in collaboration with clients for publishers such as Aperture Foundation, Prestel, Phaidon, Rizzoli, and Assouline amongst others. RJ Fernandez: In London I work primarily as a photographic printer, having worked for over 5 years at a lab called BD Images with master printer Brian Dowling. I learned so much from him as well as our colleagues Alan Beechey and Chris Clark, both amazing printers in their own right. Through BDi learned the history of photography and colour printing by working with the people that made history. Brian and I worked closely together alongside his famous clients, people I looked up to while I was still assisting in Manila. One of the reasons I studied at the Arts Institute in Bournemouth was because Nick Knight and Wolfgang Tillmans studied there! I started working in London after I graduated, shooting shows at the South Bank Centre, at the Queen Elizabeth Hall and the Royal Festival Hall. I also work as a photographer, although having a family has kept me rooted in a certain place. We travel constantly together although I would find it difficult to have a toddler running around in disused gold mines, where I shot my last project, Moving Mountains in 2012. It was unexpectedly nominated for the Prix Pictet in 2015. Why did you set up MAPA Books? And focusing on photo books specifically – publishing is a tough business and photobooks especially is a niche some would argue. RJ Fernandez: I wanted to take the level of production in London to the Philippines, essentially sharing what I’ve learned. Seeing the rise of the photobook through the years, as people came through the lab, and meeting young, independent publishers such as Aron Morel for instance — seeing how they created these beautifully produced books with these amazing photographers, while still being truthful to the artists’ vision was very inspiring. MAPA isn’t particularly limited to photography nor is it limited to the Philippines — I would love to work with artists across SouthEast Asia. Why did you pick ILI and SIGNOS as the first two publications? RJ Fernandez: It wasn’t a matter of ‘picking’ as such. It was more a deep desire and determination to make these ideas a reality. MAPA started with the idea of ILI. Six years ago, I asked Tommy Hafalla if I could publish his book. It took me three years to convince him to let me take away all his 35mm negatives to London, his life’s work, in a little pelicase. It has been thirty years since Eduardo Masferre put out the book, People of the Philippine Cordillera. When Tommy was ready to do the book, it was time. There have been many misconceptions surrounding the material culture from the Cordillera specifically with the bulul and the lingling-o. The book and the knowledge that supports it are from the people themselves. Tommy is part of the community that he documents, he has a sense of responsibility to carry on tradition as well as to share the knowledge of the culture for future generations. Veejay Villafranca is one of the beacons of Philippine documentary photography today. In 2013, Haiyan happened. The destruction to the country was unprecedented. As we were taking a step forward, it felt like we were being pushed back. Veejay was there with the United Nations documenting the climate refugees since Ondoy in 2009. SIGNOS depicts the new norm, with weather patterns changing across the world, people are starting to realize that climate change does not happen in isolation. In general, it seems as if modern Filipino culture seems to have forgotten its own history. Across the country, there are cultural modes that reflect previous stages of development, not necessarily left behind, rather, making a conscious effort to preserve by remembering. Books become our archive – more than ever they are a tool by which we remember the beauty and multiplicity of our culture and the complexity of our traditions.